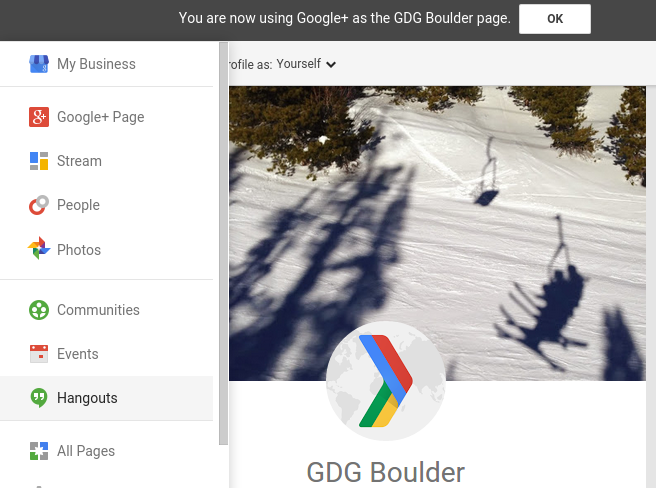 For the GDG Boulder meetup this Thursday, I would like to broadcast a Google Hangout on Air from the GDG Boulder G+ Page so that the recorded video will be saved to the GDG Boulder YouTube account. Took me a while to figure out the steps, so I want to document them here. 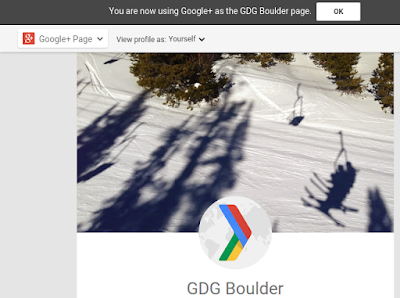 Prerequisite: You need to have a YouTube channel already linked to your Google+ page. 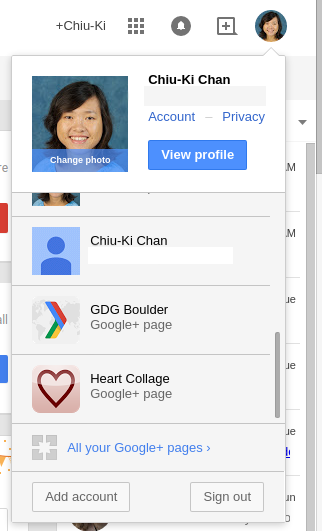 On Google+, click on your photo on the top right corner and switch to use Google+ as the Page admin. 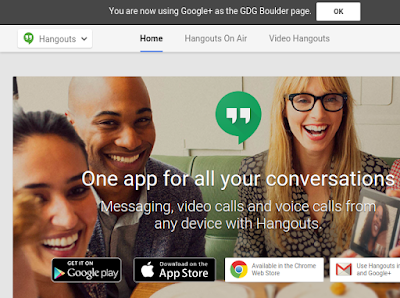 Hover on the drop-down on the left, select "Hangouts". 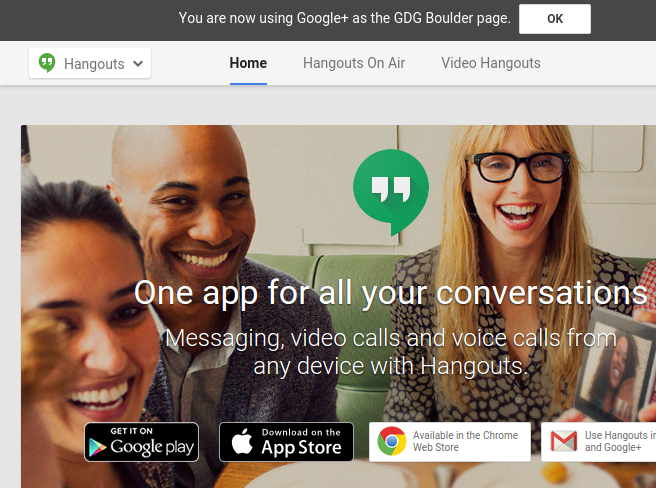 Now you are on the Hangouts page as the Page admin. Select "Hangouts on Air" from the top tabs and you can now create a Hangout on Air as the Page admin! 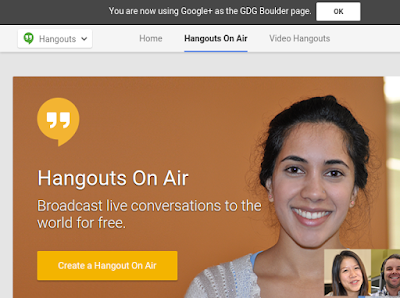 After you created your Hangout on Air, don't forget to enable the Q&A app. You won't be able to do that after the Hangout started. One key feature in Espresso is the synchronization between the test operations and the application being tested. This is built around the concept of idling: Espresso waits until the app is "idle" before performing the next action and checking the next assertion. This takes care of waiting for the UI rendering and AsyncTask completion. However, if your app performs long-running operations in other ways, Espresso will not know how to wait for those operations to finish. If that is the case, you can tell Espresso to wait by writing a custom IdlingResource. Say you use an IntentService to do some long computation, and return the result to your activity via broadcast. We want Espresso to wait until the result is returned before checking that it was displayed correctly. To implement an IdlingResource, you need to override 3 functions: getName(), registerIdleTransitionCallback() and isIdleNow(). The idle logic is implemented in isIdleNow(). In our case, we check if our IntentService is running by querying the ActivityManager. If the IntentService is not running, we can inform Espresso calling resourceCallback.onTransitionToIdle(). You need to register your custom idling resource in order for Espresso to wait for it. Do it in a @Before method in your test, and unregister it in @After. Check out the source code for a full example. Try commenting out the IdlingResource registration and watch the test fail. When I wrote my android-test-demo app, I wanted to use Jake Wharton's ActivityRule, but couldn't because I wanted to customize the launch intent for each test method. See MainActivityTest.java for more details. ActivityTestRule makes tests much cleaner. Thank you Google for making Espresso better and better! I have been using Espresso for more than a year now, and I love it. I am considering writing a book / recording a video class / giving talks & workshops on the topic, but it is a substantial amount of work so I want to gauge interest before I start. If this material is valuable to you, please let me know by filling this form. click(): What happens behind the scene? Submitted to @DroidconNYC! Advanced Espresso: custom matchers, IdlingResource & more. Fav if you want to hear it! However, the talk is only 40-minute long, highlighting maybe a quarter of this outline. It will take a lot more effort to flesh out the whole outline, so please let me know your interest by filling in this form: http://bit.ly/1H0X4up. Thank you! Update: I have started publishing Espresso courses! https://gumroad.com/chiuki. Still trying to figure out what topics to tackle next, so I'd really appreciate your input. Dependency injection allows our app and test obtain different modules. This is very useful for creating repeatable test cases. The demo app displays today's date in the format yyyy-MM-dd. We would like to test that against a known date, instead of depend on the actual date when we run the test. In Dagger 2, a Component provides modules for your whole app, and defines where to inject them. ApplicationComponent is used when the app is run normally, and TestComponent is used during tests. Both components injects into MainActivity. How does the MainActivity know which component to use? It injects via the application, which stores the component. We call setComponent() in test, which runs before onCreate(), so the TestComponent is used. When the app is run normally, component will be set to ApplicationComponent in onCreate(). Exposing setComponent in the application is not great because ideally the application should not have test-specific code. Another approach is to subclass the application in the androidTest folder and load it during tests via a custom test runner. See blog.sqisland.com/2015/12/mock-application-in-espresso.html for more details. The app has a Clock class which returns the current time. TestComponent contains MockClockModule, which provides Clock as mocked by Mockito. This way MainActivityTest can supply a pre-determined date during test. Look at the setComponent branch to see the old code for injection using the setComponent function. Master uses mock application and custom test runner for injection. Also, I am toying with the idea of writing a book on Espresso. Please take a look at the outline and fill in this form if you think I should write it! After being a software engineer for 6+ years at Google and 1.5 years at two startups, I now run my own mobile development company. I love coding, and I love speaking. Learn more on my talks page. Subscribe to my Technically Speaking newsletter for speaking tips. Download Monkey Write and learn to write Chinese! Download Heart Collage to make your own! Like my articles? Sign up for my newsletter for more. Want to dig deeper? Watch my video courses at Gumroad and Pluralsight.